President Donald Trump and First Lady Melania Trump visited disaster struck Texas on Aug. 29, praising federal and local responders for their work to safe lives. At least nine people have been killed in the state amid catastrophic floodwaters from Harvey, the most powerful hurricane to hit Texas in more than 50 years. Thousands of residents have been rescued from Harvey’s floodwaters, while an estimated 30,000 people were believed to have sought emergency shelter as the flooding entered its fourth day. 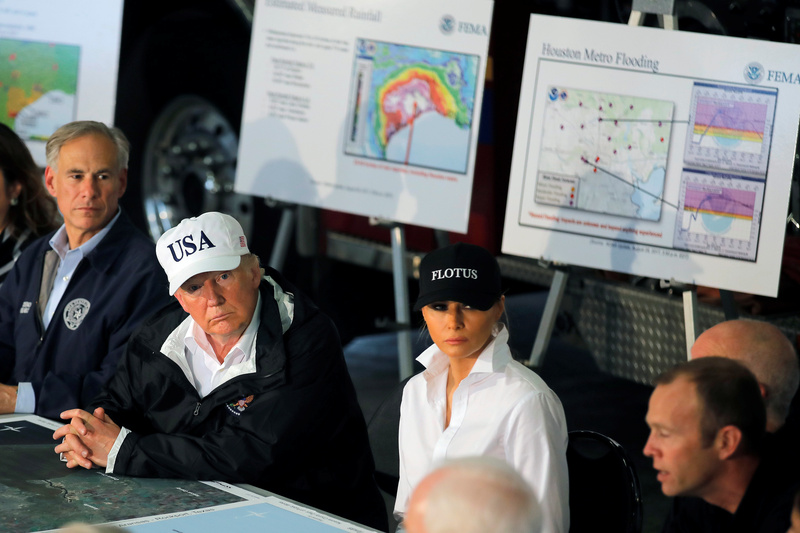 President Trump praised the collaboration between Federal Emergency Management (FEMA) officials and state and local officials. “You have been just outstanding, and I can tell you that my folks are telling me how great your representatives have been in working together. It’s a real team,” President Trump said. Trump has been closely involved in the federal response to the disaster, starting well before Harvey made landfall in Texas on Aug. 25. “I want to express my deep gratitude to the president, for him and his entire cabinet and staff for what they’ve done over the past couple weeks,” said Texas Governor Greg Abbott at a press conference following Trump’s arrival. Abbott said that members of Trump’s cabinet as well as the president himself had been in contact with him and his office to prepare for the storm about ten days in advance. “Every step of the way as the hurricane came across the shore, as the flooding began in Houston, Texas, the president and his cabinet remained in constant contact with me and my staff, and they all had one thing to say. Texas, what do you need? How can we help?”, he said. 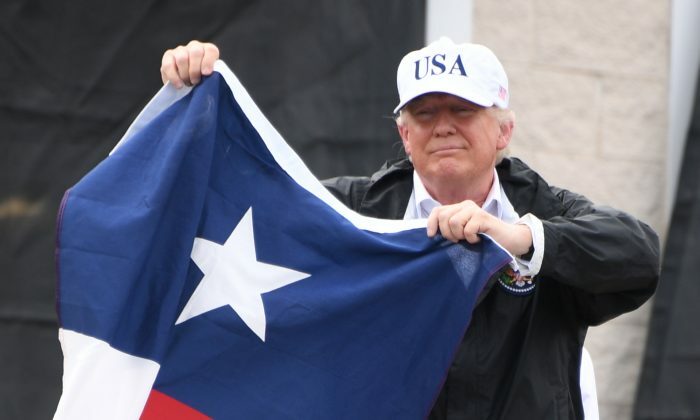 Hours before Harvey hit Texas, President Trump expedited and signed a disaster proclamation for the state of Texas at the request of Governor Abbott. Several hundred people had gathered outside of the firehouse where the press conference was held, some with Trump-Pence campaign signs. 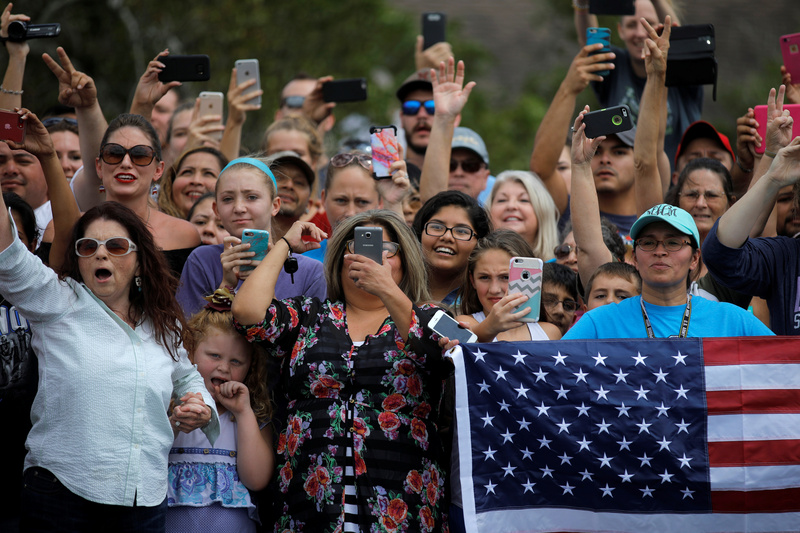 After leaving the firehouse, President Trump got up on a ladder, and told the crowd: “We love you. You are special. We are here to take care of you,” he said. “It’s going well,” the president said referring to the rescue efforts. Throughout the disaster Trump has urged those in affected areas to stay safe, and instructed his cabinet to focus on making sure that those in the storm’s path have what they need. Officials in Harris County, where Houston is located, said reservoirs built to handle drainage water were beginning to overflow on Tuesday. They urged residents to evacuate as they released water to alleviate pressure on two dams, a move that would add to flooding along the Buffalo Bayou waterway that runs through the area. Brazoria County, south of Houston, also called for immediate evacuations around a levee at Columbia Lakes that had been breached by floodwaters from Harvey. President Trump was accompanied by several of his cabinet members on the trip, including Acting Secretary for the Department of Homeland Security Elaine Duke, Secretary of Housing and Urban Development Ben Carson, and Small Business Administration Administrator Linda McMahon. During the trip they met with their counterparts in the governor’s cabinet so that they could most effectively “offer federal assistance and lay the foundation for what we know is going to be a long recovery effort,” she said.